Nov. 5 2010: We are celebrating November’s First Friday event with the release of the the PONSHOP Stencil Kit I’ve been working on over the past couple months. 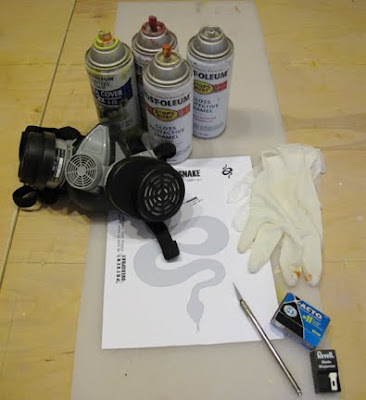 This “Do It Yourself” book includes six original graphic designs - ten stencils all together ranging from “beginner” to “expert.” Stemming from the excitement over our “Street Art” class exercises, the stencil kit acts as an extension of the course as well as a first-time tutorial for beginners. We invite any of you to the public wall of our shop where you can stencil, paint, and draw. Guests have an exclusive evening to participate with their own of spray paint, markers, stickers, wheat paste and more. In the gallery, featured artists for November include Joshua Barber (mixed media), Rob Landeck (mixed media), Ginger Huebner (mixed media), Adam Desio (acrylic and photography), Reuben Strangelove (illuminated media), and Jeremy Gann (mixed media) as well as Scarlett’s most recent ceramic creations. We are also excited to premiere local artist Bill Harris’s exclusive series of block prints.